Chojuro [Mist’s Seven Swordsmen] is the last remaining member of the Seven Ninja Swordsmen of The Mist. Later on he becomes the 6th Mizukage in Boruto. Chojuro wields Hiramekerai, a flat blade with two curved indentations. It often described as Twin Swords. Chojuro was also one of the shinobi who was caught by the Infinite Tsukuyomi. Let’s take a look at the abilities of Chojuro [Mist’s Seven Swordsmen]. Taijutsu, Ninjutsu Hiramekarei Liberation [Prompt]: Cause Water attributes damage to the opponent’s entire team and High Float to the selected opponent’s unit. Taijutsu, Ninjutsu Sweep: Attacks 3 units at the front at random and has a chance of Repulse. Ninjutsu Ninja Sword: This unit is able to use 2 Standard Attacks every round. Ninjutsu Water Style – Water Wall: Chases and Attacks a High Floated unit, causes Repulse. Ninjutsu Power of Water: Increases Ninjutsu and Attack attribute of Choujuro by 6% for each Water attribute ninja in your Lineup. 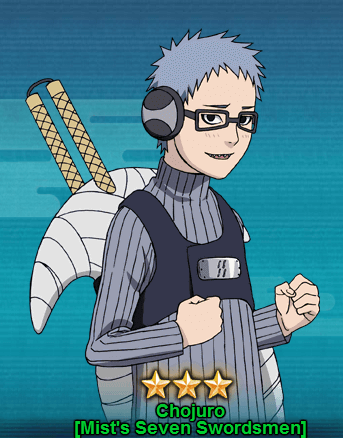 You can get Chojuro [Mist’s Seven Swordsmen] from the Kage Treasure and sometimes ninja fragments can be obtained from Survival Trial. It will take almost 60-70 seal scrolls draw to get Chojuro.